I had two major complaints when I lived in Lansing. There were no BBQ joints and we were too far from Chicago for good, close to authentic Italian beef. I still haven’t found (if there is one) a BBQ joint in Kalamazoo, but I crossed the other thing off the list today. Last night at Bell’s Eccentric Cafe, I picked up a copy of Revue. I had never seen it before, but independent magazines and newspapers are usually good places to find information n things that aren’t mainstream. They don’t have a lot on Kalamazoo, but they had one section on Kalamazoo restaurants. One of the places mentioned was a Chicago style place in the Edison neighborhood. Super Chicago Subs and Grill is on the corner of Portage Street and Stockbridge Avenue. The building is almost what I would expect to find in one of Chicago’s neighborhood’s. It’s not the most inviting place in the world and maybe even a little scary. I don’t know much about Kalamazoo neighborhood’s yet, but it didn’t look like one of the best parts of town’s. Inside the shop isn’t much better. It’s a little rundown, probably hasn’t seen a fresh coat of paint in many years, and something most people would look at and think twice about. It’s a strictly carry-out place. There’s an order counter as you walk in. To the right is a bench in case you did like we did and place your order on site. The menu board is hanging above the counter and there’s a small ice cream case with Hudsonville ice cream. Sounds like I’m not digging the place, doesn’t it? Well, if you knew me, you would know these are the kind of places that I love. I love dives and what most people don’t realize is this is the kind of hot dog stands you’re going to find in Chicago….and they’re going to be the ones with the best food. If I had to pick one food to live on the rest of my life and I couldn’t pick hamburgers, Italian beef would be what I would pick. 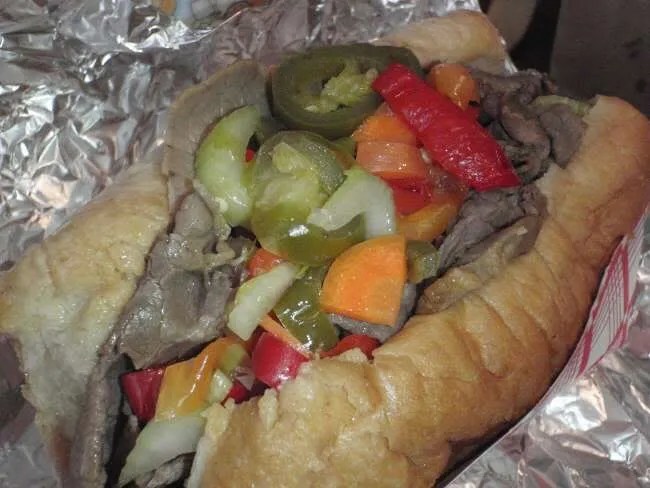 Outside of northeast Illinois, most people have never seen or heard of an Italian beef. It’s a pretty regional dish and if you’re not getting it in Chicago, you’re probably getting a French Dip. The two sandwiches are similar, but not the same. The Italian beef is a far superior sandwich. We decided to head out for lunch. We were looking for something fairly cheap, but not fast food. Super Chicago Subs & Grill hit both marks and we were pretty close anyway. We thought about trying to stop at the Kalamazoo Farmer’s Market, but we got moving a little late in the day. Not unusual for us. Super Chicago Subs & Grill had an Italian beef on the menu, so that’s what I ordered. The sandwich came with fries and a pop for six bucks. 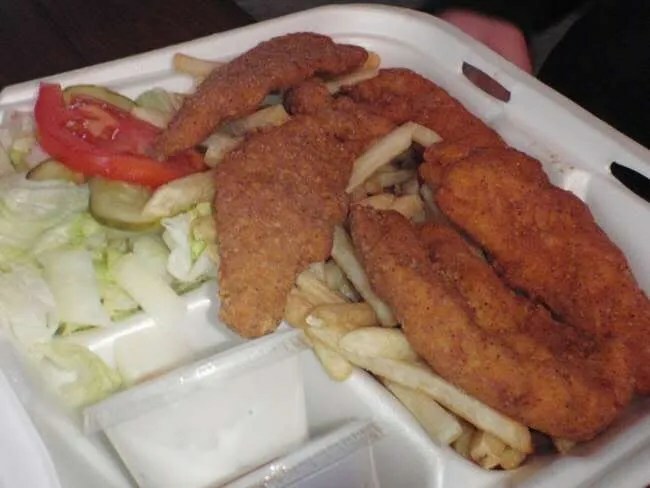 J got the chicken strips which came with fries, a salad, garlic bread, and a pop for seven bucks. For just thirteen dollars we got two complete meals. The orders are taken on paper bags just like they do at Portillo’s in Chicago. They did each order on a different bag and when our meals were cooked, they were put in the same bags to take home. We waited maybe ten minutes for our food to come up. In that time, we got to do some interesting people watching. A place like this is going to draw some characters…both customers and employees. When we got home, I tore the bag open to see what I got. I was second guessing myself on adding peppers. I guess I assumed since we were in Michigan, they were going to put sweet peppers on the sandwich. I was wrong. The sandwich looked and smelled like a true Chicago style Italian beef. It was served on a soft hoagie roll which was dipped in the gravy. The meat was thinly sliced and overstuffed into the bun. The peppers were a true Chicago giardiniera. I took that first bite and knew I found something special. 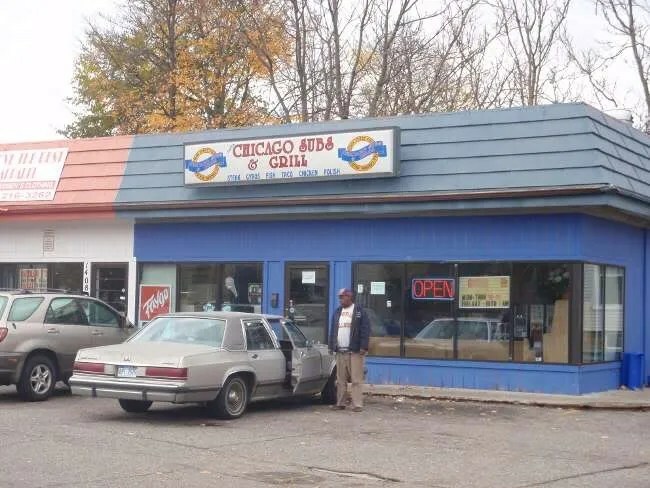 Does it stack up to Al’s or Maxwell Street? No. Not even close, but it was still delicious. My guess is it came in a kit from someplace like Vienna Beef which is fine with me. Do I really care if they make it in house or not? Not really..as long as they serve it right and they did. The fries I got were pretty cold. They were very thin fast food fries which would have been alright, but they weren’t right out of the fryer. J got a ton of food in her chicken strip meal. She got five strips that were resting on a bed of fries. The chicken actually kept her fries a little warm, so hers weren’t as cold as mine. I think she even got more fries. She really liked the chicken strips. We figure they were probably frozen, but they weren’t the typical frozen chicken strips that are mostly breading. These had a much thinner breading that actually had an Italian spice combo in them. She really liked them and there was so much food in her to-go box she couldn’t come close to eating it all. I ended up eating her fries just because they were a little warmer. The salad that came with her meal was just a little bit of iceberg lettuce that had been topped with onions. There were also pickles and tomatoes on the side. She didn’t even touch it and wouldn’t have missed it had it not been there. We were both really happy with Super Chicago Subs & Grill. I found a sandwich that I can usually only get when we go home or have shipped here for a ridiculous amount of money. Super Chicago Subs & Grill is probably a five-minute drive from our place and if I wasn’t so into trying different restaurants all the time, this place would definitely become a regular stop. Don’t let the building fool you. If you’re looking for good, cheap food, Super Chicago Subs & Grill is a good place to start. Did you try the new Pop’s Italian Beef yet? It’s over in the Cammpus Point Malll west of WMU. 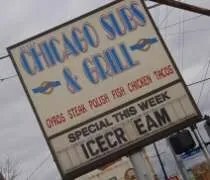 I haven’t been to either so can’t compare, but apparently it’s a South Chicago chain that’s now here..
Have not been there yet, but was curious about it. J is actually from the South Suburbs of Chicago and unti you mentioned it, never clicked that it was actually a Chicago chain. I’ve never eaten at a Pop’s. We’ll have to check the one here out.